Sheffield resident discovers old documents and postcards in late aunt’s house. Paul Harrison recently discovered hundreds of old documents whilst sorting through his late ant’s possessions. She was related to the Hallam’s, formally of Stoney Middleton. The family moved from the village to Ecclesfield in Sheffield to become needle makers around the turn of the century. Paul kindly contacted SMHCCG via their website and agreed to provide documents relevant to the village. Among the documents were some old postcards (these have been posted in the ‘Archives’ section under ‘images’ – ‘Village and Surrounds’) providing views of the village not previously seen on the website. 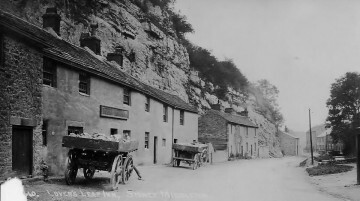 They provide new views of The Moon Inn showing the old stables (now the carpark) and the cottages which once stood on the same side of the road leading towards Calver. 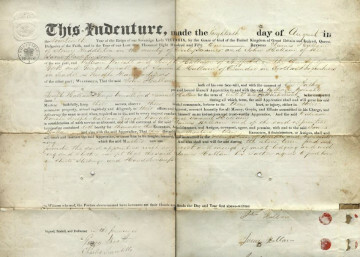 He also provided two Indenture documents (see below for meaning). The first was an apprenticeship document from 18th August 1851, committing John Hallam to an apprenticeship in needle making. 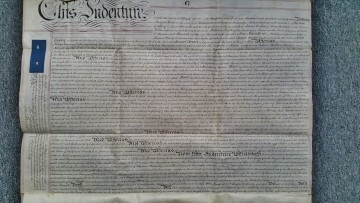 The second was made on the 24th April 1849 between Joseph Cocker the younger of Nithingend Nr Buxton, Cordwainer (shoe maker), Thomas Gregory of Eyam, James Cocker of Stoney Middleton, William Platts and wife Hannah (nee Cocker) from Foolow, Alice Handford of Nithingend, John Gregory of Calver and Samual Sarner of Eyam. 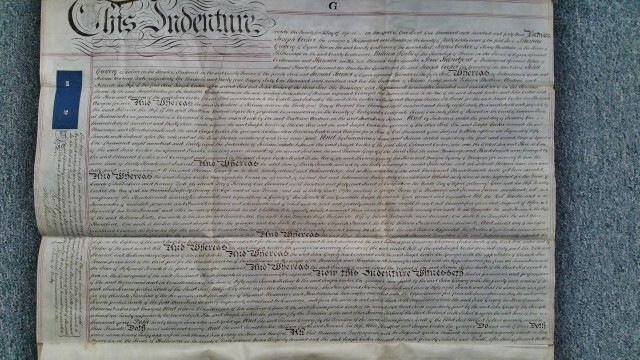 An indenture is a legal contract between two or more parties, often in relation to indentured labour, a term of apprenticeship but also for certain land transactions. Each party would then retain a part. When the agreement was made before a court of law a tripartite indenture was made, with the third piece kept at the court. The term is used for any kind of deed executed by more than one party, in contrast to a deed poll which is made by one individual. 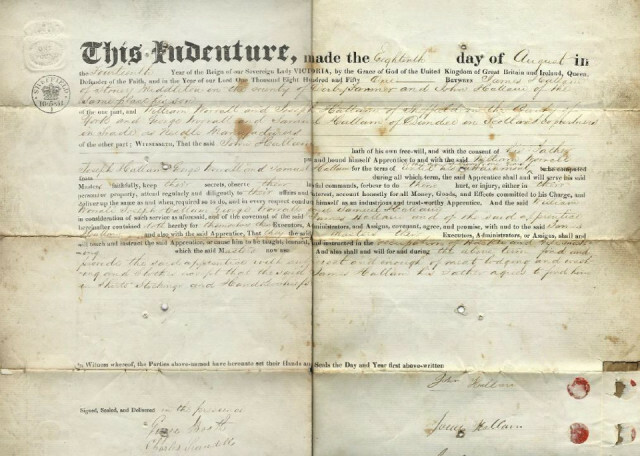 In the case of bonds, the indenture shows the pledge, promises, representations and covenants of the issuing party.